closing for a photograph. I scrambled a couple, before being scolded by a Tasmanian Scrubwren. I was a little surprised to find one here, among the willows lining the creek, with blackberries and hop plants forming a dense mass in between, much of it now acquiring that attractive golden Autumn look. Perhaps inured to passing humans, it reacted well to 'pishing', and I took several shots, two reproduced here (2 upper shots). They're seldom easy to photograph, being very active and occupying the shadier situations, so I was glad to make the most of it. The following day, I drove down to Goat Bluff, near South Arm. I was interested to see whether the Flame Robins were still present, as some of these robins form flocks, and part of the local population migrates to the Mainland. Wandering round the light scrub on the eastern side of the bluff, I found a solitary 'brown' Flame Robin, so most of the several pairs that had territories here, appear to have moved elsewhere. Watching this Flame Robin singing from the top of a fence post, I noticed another bird, also singing, on a fence wire a few metres from the robin. 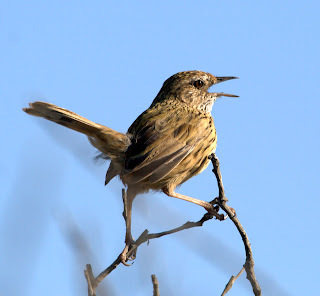 Nearing the two songsters, the robin flew, leaving the other, a Striated Fieldwren. As I watched it from a few metres away, I realised that there were at least 2 other fieldwrens in the area, also singing, in their case from on top of low bushes. I was pleasantly surprised that, in general and with care, I could get close enough to get acceptable images, two of which are shown (2 lower images). As I have found on other occasions, in sunny still conditions, almost year round, these fieldwrens call from conspicuous perches, presumably to establish or reinforce their territories. In between bouts of song, they would forage on the narrow tracks, often running along the tracks with amazing speed. So despite failing to achieve what I had set out for, on both outings, it was pleasing to get to photograph 2 birds that often prove difficult. Both species are common, in suitable habitat, in Tasmania, but, particularly the fieldwren, can prove difficult to find, notably when you're trying to find them for visiting birders! The top shot of the fieldwren is superb. 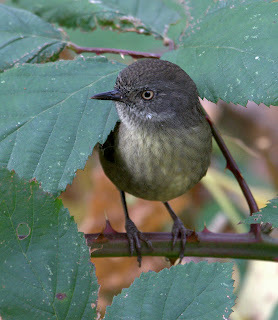 And the bottom shot of the Scrubwren looks very cute - peering out from under its leaf. I tried to choose a few different styles of shots from my previous posts on these 2 species. I just enjoyed the lower shot of the scrubwren--had a quiet chuckle! It's tempting to always show the 'best', photographically speaking, rather than trying to show a range of 'aspects' of the birds. I took a lot of both, especially the fieldwren--I must have now taken almost 1 thousand of that species! Most of them now in the bin. They're such a striking bird, though, it's hard to resist a shot of them when the opportunity arises. 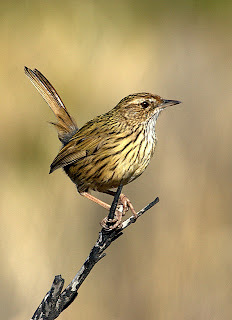 A quick search of the internet, suggests that the fieldwren seldom gets photographed. We're lucky in Tasmania that it's a common, if elusive bird. 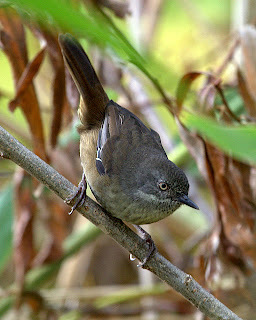 The much commoner scrubwren, I'm sure gets photographed frequently, but the deep shade that it inhabits, probably means results are often less than perfect.